Well friends, there is a lot of talk about blogging,bloggers etc etc... so , what actually it takes to create a blog? When you look from outside, blogging may seem to be a herculean task for many out there. But let me tell you friends, its really very simple... don’t belive??? Well here are the steps you need to follow.. and then, whoa!! You can create your very own blog! Just like me and thousands of bloggers out there in this virtual world !! Before you create a blog, it is important to decide on the theme or subject area your blog will cover. Two main factors should be considered when picking a topic to blog about, your audience and what you are passionate about, be it work or pleasure. Free Blogging Services :Yes, it's free, but nothing is really free. When you start a blog with a free blogging service, you don't get your own domain. You get something like mygreatblog.blogspot.com (where there are a million other blogs at blogspot.com) and you don't actually own the blog. If you ever do decide to move to your own domain, you have no way to take your readers with you, because you have no control over the site. This is the method many suggest, because it offers much more flexibility and freedom to do what you want. You will have your own domain name, like mygreatblog.com. You can get this for as little as ₨1,331.84 per year. There's no limit to what you can name your blog. Some blogs have names that relate to their subject matter - Cute Overload, Treehugger, PassiveAggressiveNotes.com. Some blogs have completely nonsensical names that are just plain catchy like Boing Boing, Small Dead Animals, The Coming. The easiest way out may just be naming your blog after yourself. Technically, you can name your blog whatever you'd like. However, there are limits to what your blog's URL or web address can be. Whatever you decide, keep in mind that a blog's name should ideally be memorable, short, easy to spell and free of hyphens. Most people like their blog's name to match its URL address. For instance, the URL address for the blog cryptechs is www.cryptechs.blogspot.com. Well waiting for what else? You are now almost at it ! 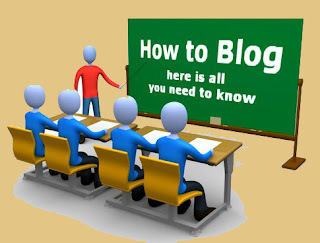 Before you go any further, it's important to learn the components of a blog. Most blogs are made up of three components - the header, the sidebar and the posts or body of the blog. 1. The header: A blog's header is the equivalent of a newspaper's masthead. It contains the blog's name rendered as text or as text combined with a banner image. 2. The sidebar: A sidebar runs along one or both sides of your posts. A sidebar might contain any number of items including a short bio, a blog roll (a list of blogs that you enjoy reading), a search box, ads and an RSS button. RSS stands for "really simple syndication." Adding an RSS link to your site allows people to subscribe to your site - updating them whenever you've posted something new. You can also add gadgets to your sidebar. We will come to that later anyway . 3. The posts: Posts make up the body of your blog. Posts can include text, images, video and even streaming audio. Most blog posts also include a way for readers to comment on the post. There a lot of cool templates out there! All you need to do is to select one among the designs that suits your blog well. Please note thta selection of a proper template plays an important role in giving a good impression to your blog. Most of the viewers of your blog will look for an authority to certify the correctness of your blog content. Thus creating a profile page with few words about your identity and purpose can instill confidence in their minds which means you could get consistent traffic for your blog ! Well these are the extras that gain attention on your blog.. try to choose them carefully. You can find a lot of cool stuff on internet freebies. Be carefull not to overload your blog with gadgets. Remember people come to your blog for content and not for those gadgets. In the world of blogging, content is king. If you want to generate an audience for your blog beyond your immediate friends and family, it is essential that your posts be well-written and provide value to readers. It's also essential that you update your blog with new posts on a regular basis. Creating a blog is easy. Maintaining a blog is hard. 1. Be Passionate. You're writing a blog because you have something to say so say it with style, enthusiasm and grace. Your voice is the only thing that will make your blog stand out for the millions of others out there. 2. Be Funny. Never underestimate the power of humor in blogging. Humor makes your posts enjoyable to read and more likely to be linked to by other bloggers. 3. Be Consistent. It's important to post on a regular basis so that your readers keep coming back. Don't post if you don't have something to say. No content is better than bad content, but maintaining your blog should be a priority if you wish to reach an audience beyond your peers. 4. Be Useful. Provide value to your readers. It might be entertainment value or educational value, but reaching out to readers means giving them something they need but didn't have before - an insight, a joke, a tool or a new way of looking at something. 5. Be Readable. Remember that you're writing text for people reading from computer screens. Your posts should be short and easy on the eyes. If they get lengthy, consider breaking up the text visually with bullet points, images or selectively bolded text. 6. Be Responsible. Blog posts almost always contain links to other websites. It's important to give credit where credit is due and link back to a site if you've used it as a reference. 1. Add your URL to Google. This tells Google's army of robot spiders to check your blog's content - adding it to Google's search results. To maximize your rank in Google's search results, be sure that your posts' headlines are clear and on topic. Keywords are more important than cleverness. 2. Claim your blog at sites like Technorati and Blog Top Sites. These are blog directories that allow people to seek out blogs on subject matters of interest to them. You can also apply to be added to the moderated directory Blogarama or try a relatively new service like BlogRush, which will advertise your blog's content across a network of related blogs. 3. Remind your readers that if they like a post, they should add it to sites like Digg,Delicious, Netscape, StumbleUpon, Ma.gnolia or Reddit. These services can help attract new readers to your site. 4. Link to other sites. The owners of the sites you link to are likely to check out your blog particularly if the link from your blog drives traffic to their site. 5. Become a regular commenter on blogs that cover similar topics to your own. You're part of the blogosphere now and therefore a potential player in a community. Provide useful and thoughtful comments on other people's blogs, and it's all the more likely that they will check out yours. So folks! All the very best to all the budding bloggers out there ... hope to see you soon in the empire of blogging !